Lucy – Has just finished Year 12, and sets out to find Shadow, a graffiti artist whose work she feels a connection with. Ed – A guy with a past connection to Lucy. They once had a date which ended abruptly when Lucy broke his nose! However he knows Shadow, so the two team together to search out the places where Shadow might be found. Leo – aka Poet and a close friend of Ed. The story is told from the perspectives of the three young people as they head out for an action packed night. Their aim is to meet two graffiti artists who go by the names of Shadow and Poet. Lucy is determined to meet Shadow because she feels that she understands his paintings. Their journey takes them on an overnight race around the town, to various locations where Shadow has painted graffiti on walls. Along the way the pair discuss different artists, and artworks, they feel an affinity with. They share their everyday joys and fears, dreams and thoughts. They meet different characters, some of them quite menacing, and their journey helps each of them to come to a realisation, and decisions about their future directions. Interspersed throughout Ed’s and Lucy’s stories are poetry from The Poet. It’s a great story, with the action taking place overnight in Melbourne. You can read some reviews on the Inside a Dog website and over at Good Reads. If you’re like me and want to find out more about the artwork, and the artists, which Ed and Lucy discuss during their search for Shadow, head on over to the Persnickety Snark blog. There’s a great post there that details all of the artworks mentioned. You’ll find that Ed loves the artwork of Johannes Vermeer, and an exhibition of Rothko’s paintings is also mentioned. Here’s a video of Vermeer’s works. “A Woman Holding a Scale” is the one mentioned in particular in the book. 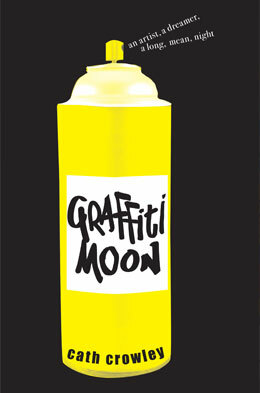 This entry was posted in Art, Book Week 2011, Cath Crowley, Graffiti Moon, New books, Young adult fiction. Bookmark the permalink. Thanks for sharing the Persnickety Snark blog. Loved this story and it was great to look at the paintings referred to in the book. Thanks for dropping by Angela. Isn’t it great to have a book that inspires us to go searching for things mentioned in it? Certainly a great book, and it’s winning lots of awards too.